There’s something so unbelievably exciting about discovering new music — or, as it happens mostly for me — having it discovered for me. Prior to my brother cluing me in on Kings of Leon, which wasn’t long after I first heard Ray LaMontagne, I hadn’t heard strong, new music for quite some time. My brother, Nick, and I have talked before about the importance of an “entry song.” In other words, first impressions make a monstrous difference. If I don’t like that first song, it’s going to be very tough to get me to change my opinion. 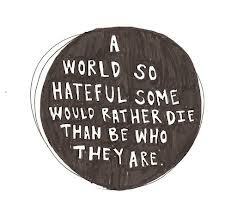 Which brings me to Macklemore. I had never even heard of Macklemore until about two weeks ago when a student of mine completed his Unit Project for The Book Thief by changing the lyrics of popular songs to those that made sense concerning the plot of Markus Zusak’s novel. He did this to Macklemore’s Thrift Shop, which I hadn’t heard before, so I checked it out. I truly wish I could get that two minutes of my life back — and it was only two minutes because that’s all I could take. Just another hip hopper, wanna be without a real message. But I was wrong. Yesterday a colleague of mine who is so up on music — especially contemporary music — that it’s not even funny, introduced me to Same Love by Macklemore. Immediately, I dismissed it. There’s no way I was going to like something by this guy, it just wasn’t going to happen. Except it did. Mary Lambert‘s voice complements Macklemore’s so well. Ryan Lewis’ beats work so well with this. I know that I have also obsessed over him at times, but I also have to admit that there are parts of the song that truly remind me of Shane Koyczan. And now I can’t get the dang song out of my head… In case you are like me and knew nothing about the song, it’s about the need to push for equality, it’s about the need for homosexuals to enjoy the same right to marry as heterosexuals. It’s about taking a stand. 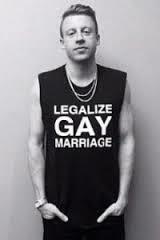 Macklemore has taken a stand – and I love that about a person. If you know anything about hip hop or rap music, you probably know that a lot of discrimination can be easily found. I’m very interested to see if Macklemore, who created Same Love prior to Thrift Shop hitting it big, thrusting him into the limelight, will be able to hold on to this message. I really hope he doesn’t give in and change his message. I hope that he continues to create videos like the one that he did for this — it’s phenomenal. Click on the image below in order to be taken to YouTube to see the video.